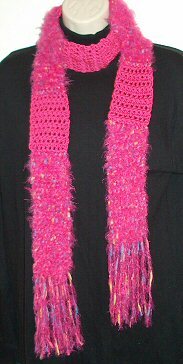 FREE Crocheted Incredibly Soft Scarf Pattern from Craft Designs for You! Finish off and weave in all loose ends. Fringe: Using Carmen yarn, cut 16 12-inch lengths. Fold each length in half and insert into 8 sc on each end of scarf.